Home > Types of Retail Career > What is Retail Banking? Retail banking is where the banks are directly involved in carrying out transactions with customers rather than with other banks, corporations or financial institutions. It is most typically associated with high street banks where customers will come into the bank and meet face to face with bank employees to discuss or make transactions relating to current and savings accounts, mortgages, credit cards and loans and, these days, also investment banking activities too which has broadened the scope for people who are looking to pursue a career within the retail banking centre. 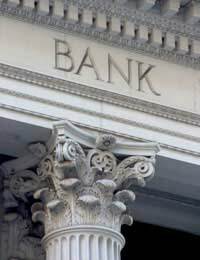 Retail banking also encompasses online banking as well. Most people who enter retail banking these days and who want to progress in their career beyond simply working as bank clerk will usually need to have at least a 2:1 degree. Although degree courses in finance studies and economics put you at an advantage, most retail banking graduate training schemes will accept just about any discipline. Without a degree or some kind of relevant diploma, career progression is more limited, although people with experience of working in customer service or sales alongside having some GCSEs, NVQs or A levels can find employment. There are also opportunities to work in retail banking in call centres without having a degree qualification. Apart from the traditional role of progressing from bank clerk to managing your own branch, there are plenty of other career paths to pursue in retail banking. You may want to work in marketing where you’ll be responsible for devising and implementing strategies to assist you in coming up with promotional campaigns to market particular financial products. This will involve researching the market and trying to identify gaps in it which you can exploit. Risk assessment is another popular career choice where you’ll be trained to assess risk factors associated with the approval or refusal of loan or credit requests. Operations Management deals with the research and development of new operational methods or processes to increase the bank’s efficiency and where the bank is looking to diversify into other areas. Human Resources is also a key role where you’ll be responsible for staff training and development as well as recruitment. Whatever your career choice, you’ll have good communication skills in addition to relevant qualifications. Most major high street banks will attend the university and college ‘milk rounds’, i.e. careers fairs where you’ll be able to obtain literature, ask questions of employees and find out more about how to apply. It’s also a good way of identifying the type of organisation you feel you might be best suited to. Larger corporations tend to employ a far greater number of graduates who follow a more rigid corporate training programme whereas in smaller companies, career paths tend to be a bit more flexible giving you more of an opportunity to work in a number of different banking roles more quickly. Banks will also run advertising campaigns for those who don’t possess a degree qualification. Depending on the level of job you’re applying for and the type of organisation you apply to, a typical recruitment process would involve completing an application form which can often be done online, and you might then be invited to attend an assessment centre from which, based upon your performance, can then lead on to one or more interview stages. Retail banking is an extremely competitive industry where many people have excellent qualifications and have good communication skills so to gain an edge, the more you read up on the banking and finance sector in general and the more research you’ve done about the specific company you’re applying to and the services they offer, the more likely you’ll stand out from the rest. Always try to find out a little bit about any recent developments within the company and who their main competitors are and what they’ve been up to.